This option allows you to select the Currency that you want to use on your website. Currently every currency that is supported by our integrated payment gateways should be listed here. Make sure that this option is matching the Primary Currency that you select inside your PayPal account. You can select where to display the currency symbol, before or after the price. This option, if selected, puts Paid Member Subscriptions in Test Mode, meaning that you can run test payments with dummy accounts. All requests will be sent to the sandbox domain (for PayPal) and you can use buyer Sandbox Accounts to complete the payment. We recommend to always test payments before going live with your website. Here you can choose which payment gateways are active and can be used to pay for the subscription by the user. By default only PayPal Standard and the Manual / Offline gateways are available. 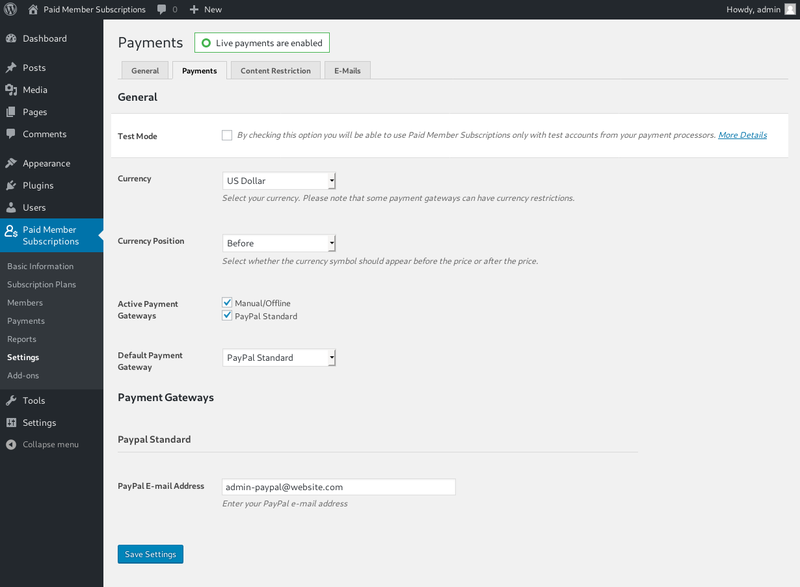 Stripe, PayPal Pro and PayPal Express are also available through add-ons. This option allows you to choose which payment gateway should be selected by default when a user is going to the registration form. According to PayPal’s Announcement, Instant Payment Notification (IPN) has been updated to https for added security. Because IPN is used for all PayPal payments, you will need to ensure that HTTPS is used when posting the message back to PayPal for verification. HTTP postbacks will no longer be supported.Action by you: An SSL certificate is required by 19 January 2016 for Sandbox testing and by 30 September 2016 for all PayPal transactions.